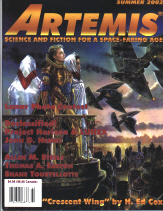 “Je Me Souviens” appeared in the Summer 2002 issue of Artemis Magazine, and was reprinted in Ride the Moon, an upcoming moon-themed anthology from Tyche Books. The hopcar soared over the crater wall and settled to the rock-strewn floor just a few meters away. Its bright-green metalwork, only slightly dulled by the dust its landing had raised, gleamed in the Earthshine. Years of trudging across the crater floor from my habidome to the shrine had turned my own moonsuit the color of old bones. Recently, my skin had begun to take on that same skeletal gray, as though, like the legendary chameleon of old Earth, I was beginning to blend in with my surroundings. Nevertheless, with both gloved hands I brushed away the fresh layer of dust the hopcar’s arrival had deposited, wanting to look my best for my visitor. After all, it had been most of a decade since the last one. The dust settled, and the hopcar’s airlock slid open, revealing my visitor, her own moonsuit so spotlessly white that it glowed almost as bright as the smooth pearl-white globe of the Earth, hanging above us. “Very well, Tia.” I waited until she joined me, then led her across the crater floor toward the shadowed wall where the shrine is buried. “I don’t see anything,” Tia said. Her lamp went out; I had never turned mine on. We waited in silence for one minute, two; then, “Oh!” she said. From the darkness ahead of us emerged the ghostly image of a door, a simple, arched doorway outlined in faint, glowing silver. Words in a thousand ancient languages and alphabets surrounded it on all sides, always the same words, whatever the language, whatever the script. “Je me souviens.” “I remember.” “Ich mich erinnern.” “Recuerdo.” A faint path outlined in the same luminescent silver wound through tumbled rocks to the door. “Now we will go in,” I said. The door swung outward at our approach, and closed behind us. We stood in a chamber walled and floored in smooth, black rock. Overhead, a single glowring, set in a golden sunburst, struck sparks of fiery light from thousands of tiny crystals embedded in the rock. For the short time we stood there, as the pumps filled the chamber with air, we might have been floating in space, surrounded by stars. The glowring changed color from silver-white to a golden-yellow, and I removed my helmet. Tia followed suit, and shook out long black hair that proved to me she seldom visited airless worlds; those who often wear vacuum suits keep their hair cropped short, as I did, when I still had hair. “I have kept this shrine for almost fifty standard years,” I said, aware, as I had not really been in a long time, of my own balding pate and lined face, thinning now toward gauntness. A part of my mind chided me for my vanity, while another part, forever young and foolish, lamented the fact this dark-haired beauty would never find me attractive. Until a few weeks ago, the chastity drugs silenced that part, but the medirobot stopped providing those drugs after my last physical examination. I stepped forward and lightly touched the inner door, and it opened, admitting us into the shrine itself. We might have been in one of the ancient churches of Earth, familiar to me from the archives of the Order. Carved from billion-year-old moonstone, the shrine is a long, high-ceilinged vault. Pillars march down both sides, carved in the shapes of trees, their branches blending smoothly into the gothic ribs of the ceiling and twining across the walls in a profusion of stony leaves and twigs. Set among the branches, like strange fruit, are globes of red crystal, each containing an oil lamp. Their soft light spills like fresh blood across the polished floor, offering the only illumination apart from the silvery glow of the nave. There stands a great basalt sphere, ten times the height of a man, the oceans and landmasses of old Earth molded in high relief upon it. Billions of photon emitters prick the surface, individually too tiny to be seen, one for each human being still living on the Earth when the great asteroid slammed into the North Atlantic, cracking the crust like an eggshell, boiling away the oceans, shrouding the dying world in steam and gas. The light is siphoned down from the moon’s surface through fiber-optic threads. As the featureless white Earth waxes and wanes, a translucent, sourceless glow likewise waxes and wanes across the basalt globe. I waited for Tia’s reaction. The last pilgrim, all those years ago, wept. Even though I visit the shrine every day, changing the oil in the lamps, sweeping the already spotless floor, polishing the globe, reciting the prayers that have been said every day in this place for most of three centuries, I occasionally find tears in my eyes, too. After a long moment, Tia spoke. “I can’t believe this is still here.” Her voice was too loud for that silent place, yet she raised it even louder, as though trying to raise an echo. There are no echoes in the shrine; reverberation suppressors built into the pillars ensure it. “Where would it go?” I said. “Let’s sit down. Even lunar gravity, I find, wears at a man my age.” I was feeling every one of my years at that moment. I slid into a pew, and she slid in beside me. For a moment, I looked at the globe. My stomach churned; my heart fluttered. How could this holy shrine, meant to last forever, have become a myth in less than thirty decades? I looked back at the globe to give myself time to gather my wits. Perhaps she felt that way before she came, I thought. But I could not believe that anyone could fail to be moved by the shrine. “And now that you have seen it?” I ventured at last. I wanted to shout at her, argue with her, cajole her…but we have strict rules against proselytizing; those who come to us must come of their own free will. I could answer questions, as I had, but that was all my vows would allow. Silent, I led her back to her hopcar. I didn’t watch her leave; instead, I turned away and trudged across the crater floor to my habidome. In the main room, between the dining table and my narrow bed, the medirobot’s casket-like diagnostic chamber still yawned open, just as I had left it after the checkup two weeks ago that had changed everything. I sat at the table and stared at the chamber. For fifty years, the medirobot had found nothing wrong with me beyond the usual ravages of time. My heart was strong; my bones, after so many years at low gravity, were not, but there were effective treatments for that, once I returned to a planetary environment. The results of my last physical had been…different. Perhaps I had missed a scheduled check-up; it seemed likely. I passed my time in ritual and work, each day the same as the one before. And my days, governed by Earth’s rotational period, bore no relationship to the alternating sunlight and darkness that crept across the eternal lunar landscape. I might well have misplaced a month; perhaps even a year. And perhaps the habidome’s shielding was not what it should have been; perhaps it had not stopped as much of fifty years of sleeting radiation as it should have. Whatever the reason, I had gone from being healthy on my second-last checkup to anything but on my last one. This time, the nanoprobes that searched every nook and cranny of my body, like the spies the children of Israel sent into the promised land, brought back report of giants in the land: an explosively metastasizing cancer that had already colonized much of my body. It meant the end of my time at the shrine. Within 24 hours, the automated hopcar that brought me supplies would arrive, and I would ride it back to Apollo City, to see what modern medicine could do for me. Perhaps nanotechnology or gene therapy or some new treatment could keep me alive for many more years, even decades. Perhaps not. Either way, my time here was done. In a way, I felt relieved. I did not regret joining the Order; I did not regret the hermitic life; I did not doubt my decision to serve God. But I had wondered, in the years since the last pilgrim had visited, if perhaps I could not have served God better on my own world, perhaps in the monastery whose white walls, looming above our farm, had so fascinated me as a child. Tia’s visit made me question my devotion to the shrine even more. If most of humanity no longer knew the shrine existed, or cared, why should I? I took off the gold-trimmed, dark green vestments I had donned for Tia’s visit, and climbed into the medirobot’s chamber. The robot stabbed me in the arm, dispensing a little of the pain medicine that helped me sleep. I climbed stiffly out, dimmed the lights, lay down on my bed, and slept. In the morning, for what I thought would be the last time, I followed my usual routine. After a simple breakfast of reconstituted cheese, bread and fruit, I donned my moonsuit and made the trek across the crater floor to the shrine. The Earth had reached full, and its perfect white ball threw my shadow in sharp relief across the crater floor even though the sun itself was out of sight beyond the wall. I wondered who would take my place; what brother or sister, young and idealistic as I had once been, would make this trek next. That thought stayed with me as I swept the shrine free of the dust Tia and I had tracked in, refilled the red lamps with oil in the hope they would burn until my replacement arrived, then opened the stone chest before the globe where I kept the holy symbols of Earth’s religion, swathed in black velvet, and began the two-hour litany of prayers. Once I had had to refer to the red-bound book that also lay within the chest for the words of the prayers and instructions on how to spin the prayer wheels and burn the incense. But the litany had long since become second nature, a calming ritual that seemed to take both no time at all and all the time in the world. Relief mingled with my sadness when I finished. I packed away the holy items, bowed to the shining globe, donned my dust-stained moonsuit, and went out through the black stone airlock. A silver hopcar waited near the habidome. Its profile looked odd. As I got closer, I realized the hopcar did not carry the usual crates of supplies. Instead, there was only a small black octagonal chest, a light in its lid blinking green: a message capsule from the Order. Puzzled by the absence of supplies, but not overly concerned, since I intended to leave the shrine anyway, I took the message capsule inside. It contained a small silver datachip nestled in thick red padding. I removed the chip and slipped it into my computer. “Greetings in the One whom all humanity serves,” began the message, which appeared only in text, without voice or vid. “I write to tell you that your long and worthy service has come to an end. The Order has decided that the Shrine to Home, which you have tended for so many years with such faithfulness, is to be abandoned. It seems clear to us that humanity no longer feels the need of worship or meditation in that once-holy spot. Our resources are limited, and constantly shrinking, as human spirituality fragments among the Hundred Worlds; and so we feel it best to close the shrine. I sat and stared at the message for a long time. Here was official permission to do the very thing I was preparing to do: leave the shrine and return to the mainstream of humanity. But it had never crossed my mind that the shrine would be abandoned, that I would be its final keeper. I should have been excited, happy, ready to drop everything and seek out the medical attention that might prolong my life. But instead, brought face to face with the impending closure of the shrine, my thoughts did not turn to the length of my life, but to its purpose. For fifty years, I had lived to tend the shrine. Abandoning that purpose to save my own life would make those fifty years, the greater part of my life, meaningless. It would mean Tia had been right, and this place no longer mattered—not to the vast crowd of humanity spread among the Hundred Worlds, not to me…perhaps not even to God. And who even knew if my life could be saved? The medirobot was not optimistic, and it was a long journey to any place that would have the latest medical technology; certainly Apollo City, an interstellar backwater now, did not. I could be dead before any ship I might board could reach any place that might have a hope of saving me. I put on my moonsuit and stepped out into the crater; but instead of going to the shrine, I stood just outside the habidome, looking up at the pure white pearl of the Earth. The asteroid that slammed into humanity’s home had been unexpected, devastating, and fatal. But humanity lived, through God’s grace; and in a way, the Earth, too, lived on, in images, words, thoughts, beliefs—and in this shrine to its memory. My cancer was just as unexpected, just as devastating, and just as fatal. But if the shrine closed, nothing of me would live on beyond my death; my years in service here would be forgotten, a footnote in the Order’s archives, nothing more. I could do nothing to make the Order keep the shrine open; but I could, perhaps, reach beyond my death to those who might someday come here after me, just as the shrine was meant to do. I sent the hopcar back with a reply acknowledging the message from the Order, announcing my resignation, and letting them know I would not be returning to Manor. Then I began my final vigil. For days now the pain has been constant. I will no longer let the medirobot dispense the drugs that could ease the discomfort. The pain will end soon enough, and in this place of mourning, pain is appropriate. I no longer follow my ritual of cleaning and prayer. Instead, I spend most of my time in the shrine, gazing at the globe. I let its silvery light wash over me like water, light from eight billion fitful ghosts…soon to be joined by one more. The last oil has burned in the blood-red lamps, so the shrine is darker now. Soon, the last of the food will be gone, or the water will run out…or perhaps the pain in my cancer-ravaged body will become too much for me to bear. And then, my waiting will cease. I have programmed the computer that controls the shrine’s functions to open the inner and outer doors together on my voice signal. When the time comes, very soon, I will enter the shrine, hang my moonsuit by the door and make my way to the altar. I will surround myself with the holy items of a hundred faiths, open the red-bound book and place it on the floor, then prostrate myself before it. And then I will command the airlock to open. Open to vacuum, sheltered in the crater wall, the shrine may last a million years or more. The fiber optics that cause Earthlight to play across the basalt globe may fail, but the globe itself may endure long after humanity itself has vanished from the galaxy. 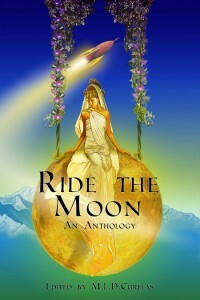 But if, someday, a human or whatever humans have become returns to the Moon and finds the shrine, they will also find, prostrate before the globe, one faithful man still honoring the billions who, unable to flee into space, died on humanity’s ancestral home—and the grace of God, through which a remnant of the human race survived. We each must find the purpose for our own life.